Americas gateway to the universe. Leading the world in preparing and launching missions to Earth and beyond.July 14, 2000 John F. Kennedy Space Center Spaceport Newshttp://www-pao.ksc.nasa.gov/kscpao/snews/snewstoc.htmVol. 39, No. 14CNN focuses on KSC workers during STS-92 flow CNN is taking an in-depth look at Shuttle processing at Kennedy Space Center for an hour-long documentary that covers preparation for the 100th Shuttle mission launch. The r eport, which is expected to air in January, will be unique both because of the level of access given to CNN and because of its focus on KSC workers. Although there have been a number of reports on the space program, we feel theyve overlooked the real story: the people who turn the wrenches, said CNN reporter Miles OBrien, who is leading the special project with his producer Linda Saether. KSC workers are being videotaped doing their jobs during the STS-92 flow by OBrien, Saether and CNN videographers. Representing the 100thShuttle mission, the launch of STS-92 on Discovery is targeted for Oct. 5. When you talk to KSC workers, you begin to realize the amazing amount of experience and expertise they have, OBrien said. This has been an incredible opportunity for me as a journalist to be given the chance to go behind the scenes of the Shuttle program and get some insight into what is done here. OBrien and his producer, who are based in Atlanta, have visited KSC numerous times since the project got under way here in December.TDRS liftoffThey and additional camera operators have videotaped about 37 flow events and plan to tape at least that many more through the STS-92 launch. OBrien is doing much of the videography for the special report both because its a timeintensive project and because he did camera work during his early days as a television journalist. It was a necessity thats turned into a benefit, OBrien said. Im finding that the people Im interviewing are much more relaxed because of this more informal shooting approach. (See CNN, Page 6)Hour-long documentary expected to air in JanuaryCNN reporter Miles OBrien takes a break from interviewing KSC workers for an hour-long documentary. The report will cover preparations being made for the 100th Shuttle mission launch. NASAs newest Tracking and Data Relay Satellite (TDRSH) lifted off from Cape Canaveral Air Force Station at 8:56 a.m. EDT on June 30 aboard an Atlas IIA rocket. TDRS-H is the first of three satellites that will be used to upgrade the constellation of six satellites used by NASAs Space Network. The network serves as the primary means of continuous voice, television and high-data-rate communication with the Space Shuttle.Page 7 Ed Gormel retires, takes Spaceport Florida post. Page 8 KSC gearing up for Take Our Children to Work Day. 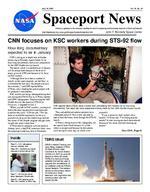 Page 4-5 Students put career interests to litmus test at KSC.InsidePage 3 U.S. Lab passes vacuum chamber test. SPACEPORT NEWS July 14, 2000 Page 2 Part III: Coveys 7 Habits help everybody winThe first two parts in a refresher on Stephen Coveys book The 7 Habits of Highly Effective People were printed in the past two issues of Spaceport News This issue presents Habits 4 and 5. Stephen Covey calls Habits 4, 5, and 6 Public Victories because before you can move into the optimum interdependence you must build a foundation of true independence. Covey believes we cannot get to where we want to go unless we first achieve the following three habits of interpersonal effectiveness: Habit 4 Think Win-Win Habit 5 Seek First To Understand, Then To Be Understood Habit 6 SynergizeHabit 4 Think Win-WinWhen we want other people to win as well as yourself, we are thinking W in-Win. Because we have been conditioned to think otherwise, we must script (a popular psychology term) ourselves to work with the premise that one persons winning does not mean someone has to lose. Win-Win is seeking solutions that involve cooperation and promote mutual success. These agreements combine quality and commitment, as they are the products of at least two minds that believe in them. An alternative, superior in some respects, is Win-Win or No Deal. It means that when both sides cannot come to an agreement or deal that is mutually agreeable, they simply agree not to deal. In athletic contests, where both parties agree to play the game by certain rules or live with the consequences, the rules repr esent the W in-Win value system. In order for a team to win there must be a WinWin attitude on the part of the team members. There must be a willingness to behave in an interdependent manner for the good of the team. No matter how polarized the parties may be in a situation, there are always some aspects that can be agreed upon. The only way to discover an alternative is to keep the lines of communication open. Active listening with the intent to understand, plus the honest expression of feelings, is a WinWin approach to pr oblem solving. Win-Win is a total philosophy that builds on the character traits of integrity, maturity, and the abundance mentality. Covey defines these attributes as: Integrity the value we place upon ourselves and the keeping of commitments. Maturity the courage balanced with consideration in the expression of feelings and convictions. Abundance mentality the seeing of life as having plenty for everybody and attempting to create many options to help others make the most of every situation. Trust is the foundation of healthy human relationships and is indispensable to all WinWin situations. Losing systems can be changed with a proactive approach, working with a positive attitude within the spheres of influence.Habit 5 Seek First To Understand, Then To Be UnderstoodCovey calls this The Habit of Communication, as it is an attitude of openness coupled with the skill of active and empathic listening. This means being genuinely interested in seeking anothers point of view, r egar dless of whether or not you agree. As a doctor would not prescribe before he diagnoses, an active listener gathers all the facts and attempts to understand them before making a judgment. This allows for decision making based on knowledge rather than ignorance. Before we can understand another person, we must exercise the principle of empathy, placing ourselves in the other persons place in order to understand his point of view. We must be willing to be influenced, foregoing ideas of right, wrong, winner and loser. When we satisfy the other persons need to be understood, he will most likely make an effort to understand our point of view. We create a climate of openness that is nonthreatening and allows for opening up the lines of communication to third alternatives and eventually a W in-Win situation. We must move beyond autobiographical responses that cause us to translate others words and feelings to fit our opinions and experiences. Empathic listening requires us to reflect on what is being said and restating as clearly as possible what we understand. This makes it easier for all parties to examine and clarify their thoughts at their own pace. It is necessary to recognize nonverbal communication and the subtle expressions of face and body. Most issues have emotional overtones that demand r ecognition if a W in-Win situation is to exist. Empathic listening can backfire if it is perceived to be manipulative. Be direct and let the other party know that you are trying to be understanding to their point of view and need their help to be successful at it. Be willing to make such a statement and mean it or this skill will become a weapon that will finish you. Once we understand, we can begin to be understood. This can be a process that takes one step forward and two steps back in an effort to discover that third alternative that is part of a Win-Win equation. Ask the following four questions before moving on to being understood. Do I avoid autobiographical responses? Do I faithfully reflect my understanding of the person? Do I focus on feelings as well as words? Do I watch nonverbal cues to discern feelings? Covey refers to empathic listening as the highest level of listening. We listen with ears, eyes and heart to move below the surface meaning to the root feelings and issues that really matter. Be sure and check out the next issue for the final installment of Stephen Coveys 7 Habits Revisited. W ell finish the series with a closer look at Habits 6 and 7. STEVEN CO STEVEN CO STEVEN CO STEVEN CO STEVEN CO VEY VEY VEY VEY VEY , , 7 HABITS OF HIGHLY EFFECTIVE PEOPLEAs a doctor would not prescribe before he diagnoses, an active listener gathers all the facts and attempts to understand them before making a judgment. This allows for decision making based on knowledge rather than ignorance. SPACEPORT NEWSPage 3 July 14, 2000The U.S. Laboratory Destiny successfully completed a series of milestone tests that move it closer to its final destination space. The 32,000-pound research lab was the first International Space Station (ISS) pressurized element to spend seven days in a renovated vacuum chamber last used when Americans walked on the moon. The 28-foot-long, 14-foot wide lab was placed in the chamber July 1 to undergo the element leak test. Completing this test was a large step in meeting the labs Destiny: launch early next year. Its performance exceeded expectations, boosting our confidence in on-orbit performance. Im very happy for the lab team, said Tip Talone, director of International Space Station and Payload Processing at KSC. NASA and Boeing employees coordinated the operation. Testing the laboratory in the vacuum chamber has provided us with the information we need to ensure Destiny is leak free and safe for the astronauts to inhabit while working at the International Space Station, said John Elbon, Boeing director of ISS ground operations at Kennedy Space Center. To perform the test, the laboratory was placed on the rotation and handling fixture inside the Operations & Checkout Building high bay, raised to vertical, lifted and moved to a point above the chamber, then lowered inside. Once the lid was secured, the chamber created a vacuum environment equivalent to 257,000 feet altitude or 48 miles to determine if the module had any leaks and confirm the rates at which gases were consumed. The three -story, stainless steel chamber is one of two built by NASA in 1964 to test the Apollo program flight hardware. The 33-foot-wide by 50-foot-tall chambers were used to simulate a low-Earth orbit environment for the command and lunar modules. Both chambers were deactivated in 1975 when the Apollo-Soyuz project ended. In 1998, NASA selected the Boeing payload ground operations contract team to renovate one of the two chambers to leak test pressurized elements of the Space Station. The team, which included NASA and Dynacs Engineering Co., provided designs for the new vacuum chamber pumping equipment and controls, a new control room and a new rotation and handling fixture. The U.S. Laboratory as been designed to provide world-class, state-of-the art facilities to complete scientific r esearch in zero gravity. Destiny is among more than 216,000 pounds of Space Station elements, including truss sections, that are being prepared for flight at Kennedy Space Center. The lab is scheduled to be launched on Shuttle mission STS-98, the 5A assembly mission, targeted for Jan. 18, 2001.U.S. Laboratory aces vacuum chamber testThe U.S. Laboratory Destiny in the Space Station Processing Facility, at left, was rotated before being lifted and lowered, above, into a payload canister. Destiny was transferred to the Operations and Checkout Building for vacuum chamber testing and was determined to be leak free and safe. The module is among more than 216,000 pounds of Space Station elements, including truss sections, that are being prepared for flight at KSC. The lab is scheduled to be launched on Shuttle mission STS-98, the 5A assembly mission, targeted for Jan. 18, 2001. Page 4 SPACEPORT NEWS July 14, 2000 Future Space Leaders Future Space Leaders Future Space Leaders Future Space Leaders Future Space LeadersSHARP students spend the summer learning hands-on career lessons Merritt Island High School student Christina Blyth had been thinking for several years about pursuing a career related to the environment. But the soon-to-be senior wondered what it really would be like to do such work. Now she knows. Blyth has been working for a month with environmental scientists at Kennedy Space Center thr ough NASAs Summer High School Apprenticeship Research Program (SHARP). The eight-week paid program pairs scientists, engineers and other research specialists with students to give students hands-on experience and mentoring in careers they are considering. I cant begin to tell you how much Ive learned, Blyth said. Ive found out so much studying the animals and plants here, and Ive even started learning about statistics. Ive definitely decided to pursue environmental science. Blyth is one of 21 apprentices at KSC working in areas including web page design, computer information systems, media productions, orbiter tile r epair, laboratory te sting and hydroponics. Enrichment activities for the students include public speaking, resume writing, problem solving and technical writing. Students primarily spend their time working with their mentors on a variety of research and operational projects. Blyth, for example, is assisting with a sea turtle nest count made each day on a 13-mile section of Cape Canaveral Air Force Station. In addition, shes crunching numbers on three years worth of data for a beach mouse research project. The aim of SHARP is to encourage students to pursue career paths that increase the pool of underrepresented science, mathematics, engineering and technology professionals. The program is also useful in helping redirect students to science areas that better suit their personal preferences and talents. Just because you have an interest in something doesnt mean youre going to like doing the work involved. Its important to find out whether you will. Ultimately youre going to do a better job at something you enjoy, said Blyths mentor Jane Pr ovancha, who is the Conservation group leader and Dynamac Corp.s program manager for the Envir onmental Support Contract at CCAFS. Provancha has served as a mentor for student programs since 1983. The SHARP program began in 1980. Each year about 200 SHARP apprentices are selected from a nationwide pool of 1,400 rising high school juniors and seniors. The selected students are placed at one of nine NASA field installations throughout the United States. To be eligible for SHARP, students must have an overall 3.0 grade average; demonstrate a strong interest in and aptitude for a career in mathematics, engineering or the sciences; attend school within a 50-mile radius of the NASA field installation; be available on a fulltime basis (40 hours a week) for the duration of the program; be recommended by teachers; and write a 300-word essay. SHARP provides an extensive mentoring oppor tunity at a time in a students life when he or she is making serious long-term education goals, said Mark Mullins, SHARP program coordinator. The world-class mentors who assist our apprentices are invaluable to their summer experiences. One goal of the program is that these students will continue to consider NASA as they understand the vision of Kennedy Space Center and how space exploration plays a part in ever yones future. By the end of the eight-week program, students really do stand at the gateway to the universe with a clearer outlook of what it holds for him or her. At the completion of the program, students publicly present reports of their experiences and results of their research. The presentations will be made the morning of July 28 in the Universe Theater at the KSC Visitor Complex. The public is invited.Summer and spring student workers a mentors prove experience is the best t Pictured counterclockwise from left: S H student Kimberly Banks, whos consid e pursuing a career in engineering, wor k Systems Engineer Chaz Wendling. Lo Operations Engineer Dorothea Kuzm a mentors SHARP student Matt Gerron. Christina Blyth, a SHARP student, rid e all-terrain vehicle while tracking turtle at Cape Canaveral Air Force Station. H progress is followed by Environmenta l Scientist Alexis Alicea. Courtney Can n Rebekah Smith practice public relatio n the Press Site during the spring. SHA R student Hang Van gets hands-on exp e with Shuttle tiles. SHARP student Ca m Humes, interested in a career in the m field, conducts a laboratory analysis. Page 6SPACEPORT NEWS July 14, 2000USA names deputy program manager for FloridaCNN ...(Continued from Page 1)Dennis Huefner, a Shuttle systems technician, is one of dozens of front-line workers OBrien has interviewed already. Huefner, who has worked at KSC for about 15 years, was repairing Discoverys right inboard elevon (trailing edge of the wing) during his discussions with OBrien. I was a little nervous about being interviewed on camera at first, but after awhile it felt comfortable, Huefner said. I was glad to explain the critical nature of the repair and how it was being made. CNN is giving us the opportunity to share with the public what we do here. Im hoping they will cast it in a positive light. The CNN project is being coor dinated by KSCs Public Affairs Office. Were getting CNN the best access we can, but doing it in such a way that safety is not compromised nor the flow schedule disturbed, said Joel W ells, NASA public affairs officer. The time public affairs is devoting to assisting the CNN project is a worthwhile investment in educating the public about the value of the Shuttle program, Wells said. When you do something difficult successfully a hundred times, people sometimes forget the sheer complexity and effort of the operation, Wells said. People are impressed by Shuttle launches, which are very visible, but the people behind the scenes who make it happen are equally as impressive when you know their stories. It was an earlier media event that spurred the idea for the documentary, OBrien said. For the first time in the history of the Shuttle program, journalists were given access into an orbiter during the glass cockpit media event held at KSC in April 1999. The newly refurbished Atlantis with its flat-panel cockpit displays was showcased. Were hoping that the r eport will help people understand more about the Shuttle program, the challenges it faces and where its going, OBrien said. I know I have much more respect for the program now that Ive gotten a chance to get behind the scenes.William Pickavance CNN reporter Miles OBrien and videographer Dan Beckman, above, survey the scene as a main engine arrives at the Orbiter Processing Facility. At right, OBrien instructs a KSC worker on using a microphone before an on-camera interview.United Space Alliance announced the establishment of the Office of Deputy Pr ogram Manager, Florida Operations. The move is being made in anticipation of a steady increase in Shuttle flights to the International Space Station and in support of ongoing program-wide improvement initiatives. U.S. Navy Rear Admiral (Ret.) William Bill Pickavance was named to the new post, effective July 1. He will be joined by former Shuttle astronaut Andrew Allen, who will serve as director of technical operations. This new office will serve as the management focal point for all USA program operations in Florida and will strengthen our team for the next major phase in the program ISS assembly, said USA Program Manager Howard DeCastro. As vice president and deputy program manager, Pickavance will be responsible for overseeing the day-to-day operations of all USA Space Shuttle program elements in Florida, including ground operations, logistics and solid rocket boosters. Pickavance will report to the USA program manager and will serve as the top program representative to the NASA customer at the Kennedy Space Center. Associate program managers (APMs) for each Florida element will report directly to him. Pickavance joins USA following a long and distinguished career in the U.S. Navy beginning with his enlistment as an ensign in the U.S. Naval Reserve in 1968 and culminating in his most recent assignment as director for operations, U.S. Pacific Command. Pickavance served in a number of increasingly responsible capacities throughout his career as a Naval aviator and, among his many accomplishments, commanded the aircraft carrier USS Kitty Hawk from June 1993 to January 1995, winning numerous awards for operational excellence. As director, technical operations, Allen will be responsible for the development and integration of technical operations across the Florida program elements. Allen, who previously served as program manager, Space Shuttle development, will also advise Pickavance on program-wide technical issues. Page 7SPACEPORT NEWS July 14, 2000Gormel toasted, roasted before heading to SFASaid of Ed Gormel: ... he is fair, a friend to everyone he meets, and would make any personal sacrifice for his subordinates. Space industry leader recognized for service to programEd Gormel, at top left, responds to KSC Director Roy Bridges comments. Gormel, surrounded by his family, at left, opens one of his retirement gifts. Gormel is leaving his position as executive director of the Joint Performance Management Office, but will continue as a space program leader in his new role as director of spaceport development with Spaceport Florida Authority.After serving our nations space industry for more than 30 years, Edmond F. Gormel is moving from his current position as the executive director of the Joint Performance Management Office (JPMO) to become director of spaceport development for the state agency Spaceport Florida Authority. Although Gormel is retiring from JPMO, he will still have a significant impact on KSC. His new position will allow him to help bring more launch business to the Space Coast, as well as facilitate current business partnerships between NASA and the private sector. Gormel is on the committee that is planning the celebration of 50 years of launches in Florida, so he continues to be an important member of the spaceport family. Gormels service to the space program was honored at his retirement party held on June 30 at the JPMO office at Cape Canaveral Air Force Station (CCAFS). Center Director Roy Bridges, who spoke at the event, had this to say of Gormel: Ed was a great choice as the first director of the Joint Performance Management Office. He helped us make tremendous progress toward our vision of the Cape Canaveral Spaceport. Gormel began his career with JPMO in 1998 as its executive director and was promoted to Senior Executive Service. The JPMO is a NASA and Air Force staffed organization responsible for management of the Joint Base Operations and Support Contract (J-BOSC), which provides support to the nations spaceport at KSC and CCAFS. The partnership has contributed significant cost savings and efficiencies to the space program and was r ecognized with Vice President Al Gores Hammer Award for excellence in reinventing government. Michael Sumner, the chief of operations for Spaceport Ser vices, was the emcee for Gormels retir ement coffee party. Sumner, who worked with him at JPMO, said of Gormel: Some of his finest attributes are the facts that he is fair, a friend to ever yone he meets, and would make any personal sacrifice for his subordinates. But the program wasnt entirely serious. Gormel was roasted by some of the JPMO folks, who affectionately called Gormel names such as maverick, cowboy, ener getic, and a Yankee who drives a redneck tr uck (complete with stinky shrimp traps). One speaker even referred to Gormel as Yoda, likening his wisdom to the out-of-this-world character from the movie Star Wars Gormels wisdom comes from much experience. After graduating in 1962 from both the University of Rochester and the Air Forces Officer Training School and Communications Officer School, Gormel started his active military service with the Air Force. Beginning as instrumentation and range safety systems branch chief at V andenberg Air Force Base, where he directed the launch operation of systems for Titan, Atlas, and Minuteman missiles, Gormel has been an integral part in the civil and military aerospace industry. After leaving active military service in 1966, he began working with Pan Americans aerospace support division at Cape Canaveral. It was with Pan America that Gormel held the positions of pr ogram manager, superintendent of range operations, and special assistant to the manager of Cape Canaveral Support Services. In 1972 he obtained an M.B.A. from Stetson University. Gormel joined the ranks of the federal service in 1975 with the Naval Ordnance Test Unit (NOTU). He served as test conductor for the development of the Trident I missile, and in 1982 he was pr omoted to be the NOTUs test supervisor of fleet ballistic missile launch operations. Two years later, Gormel transferred to the USAFs eastern test range (ETR) and the position of chief of the range scheduling division. He was selected to be the ETRs director four years later in 1988. In 1992 Gormel was named the director of plans for the Air Force Space Commands 45th Space W ing at Patrick Air Force Base. Gormel has an impressive list of awards, in addition to the Hammer Award. His other awards include the Air Force Commendation Medal, the Navy Superior Civilian Ser vice Award, the Air Force Meritorious Civilian Ser vice Award, and the 10-Year Fleet Ballistic Missile Ser vice Award. Gormel is married to his wife of almost 40 years, Marjorie, and has two daughters, Jennifer Davidson-Gormel of Santa Fe, N. M., and Capt. Andrea Gormel. Capt. Gormel is an Air Force attorney stationed in T urkey. His two grandchildren, Maya and Austin, attended his retirement party along with his sister Mildred. John F. Kennedy Space Center Managing editor. . . . . . . . . . . . . . . . . Bruce Buckingham Editor. . . . . . . . . . . . . . . . . . . . . . . . . . Kathy Hagood Editorial support provided by InDyne Inc. Writers Group. NASA at KSC is located on the Internet at http://www.ksc.nasa.govUSGPO: 533-128/00036Spaceport News Spaceport News is an official publication of the Kennedy Space Center and is published on alternate Fridays by the Public Affairs Office in the interest of KSC civil service and contractor employees. Contributions are welcome and should be submitted two weeks before publication to the Media Services Branch, XAE-1. E-mail submissions can be sent to Katharine.Hagood-1@ksc.nasa.gov Page 8SPACEPORT NEWS July 14, 2000U.S. Savings Bond Drive onFor the eighth year, Kennedy Space Center is opening its doors to the children of KSC employees. The Center will celebrate Take Our Children to Work Day on July 28. The day, which is themed Freedom to Be What I Dream in 2000, targets children from 9 to 15. KSC employees are invited to bring a son or daughter, grandchild, niece or nephew, or a neighbors child to work with them to share the work experience. The day is designed to encourage children to set future goals for themselves and to build on those goals during their school years. Sponsors may bring more than one child, but only children nine years and older may participate. As in the past, children may not be taken to any work area requiring a controlled access badge. In addition to Kennedy Space Center gates, Gate 1 at Cape Canaveral Air Force Station (CCAFS) will be open to employees who bring children to work with them. Employees working on CCAFS property may take the children to their work areas as long as they do not work in a controlled access area and their company is participating. KSC contractor employees should contact their Public Affairs office or Human Resources office to determine the level of participation available to them. A number of special activities are planned. Open to children of NASA employees only Due to limited seating, only NASA employees may participate in the following programs: 7:30 8 a.m., KSC V isitor Complex, gathering in IMAX II Theater. 8 9:30 a.m., special program begins -a science demonstration by the Exploration Station. If there are any individuals who require a sign language interpreter, please contact W anda Petty at 867-9165 no later than July 17.Take Our Children to Work Day set for July 28 This years Federal Savings Bond Campaign at Kennedy Space Center runs through July 28. Employees are being offered the opportunity to invest in U.S. Savings Bonds and build financial security. During 1999, more than 55 percent of KSC employees were savings bond holders. NASA is hoping to increase new participation by at least five percent this year and reach a 10percent overall increase in new bond holders and current bond Open to all contractor and NASA children Beginning at 9:30 a.m., at the KSC V isitor Complex there will be a robotics demonstration by Steve Van Meter, NASA hazar dous duty robotics specialist and the For Inspiration and Recognition of Science and Technology (FIRST) robotics demonstration. The demonstrations will take place between the Galaxy Center and the pond by the Astronauts Memorial. The KSC Visitor Complex spaceman will be available at this location for a photo oppor tunity. All NASA and contractor employees and their children are invited to take a bus tour. T ickets must be purchased on July 24, 25 or 26, at Windows No. 1 through 4 in the Ticket Pavilion at the KSC Visitor Complex between 1 1a.m. and 4 p.m. Tickets will be $14 for adults and $5 for children. Sponsors may bring as many children as they wish on the tour, but no unaccompanied children will be allowed. V isitors may stay at the tour stops for as long as they wish. Special T ake Our Children to Work Day badges will be distributed. Contractor employees should contact their own representatives to obtain badges. NASA employees may pick up their badges on July 25, 26 and 27, between 10 a.m. and 2 p.m. in the Headquarters Building lobby and the Operations Support Building lobby. The following instructions apply to all attendees: All children must be at least nine years old. Children must wear their badge and be with a badged employee at all times. The sponsor is responsible for the children they bring -the child may go with another person to another work site, but ultimate responsibility remains with the sponsor. Children may not enter any area which requires a controlled access badge. Personnel working in these areas, which include the Vehicle Assembly Building, Orbiter Processing Facilities, and Operations and Checkout Building, may arrange for another person to take their child to an approved area. For more information, contact Jean Rhodes in the NASA Equal Opportunity Program office at 867-9170 or Liz W ise at 867-8250.Scenes from past Bring our Daughters/Bring Our Sons to Work Days held at Kennedy Space Center. This year the days have been combined to create Take Our Children to Work Day.holders allotment increases through the Payroll Deduction Program. If you invest about $3 a day in Series EE bonds for 30 years, at an average return of five percent, your nest egg grows to $83,000. At six percent, its worth $100,000. Another advantage: You may be eligible for special tax benefits from bonds used for college or other higher education and training. Further information can be found on the Web site at www.savingsbonds.gov.